TULSA, OK (July 30, 2018) – As the owner or co-owner of nine new car dealerships, Keith Haney knows a thing or two about selling cars. Few mean as much to him personally, though, as the pair he’s just put on the sales floor—“Notorious” and “Enigma”—his dual championship-winning Pro Modified and Radial vs. the World entries. The pair of nearly identical appearing, nitrous-boosted 2014 Camaros are both race winners and both carried Haney to season titles last year in the Frankenstein Engine Dynamics Mid-West Pro Mod Series (MWPMS). But the Tulsa-based businessman said it’s time to pass them on to a new owner. “First of all, I want to make it perfectly clear that this decision to sell is only about the cars. I’m not getting out of racing and even more specifically I’m not leaving the Mid-West Pro Mod Series. 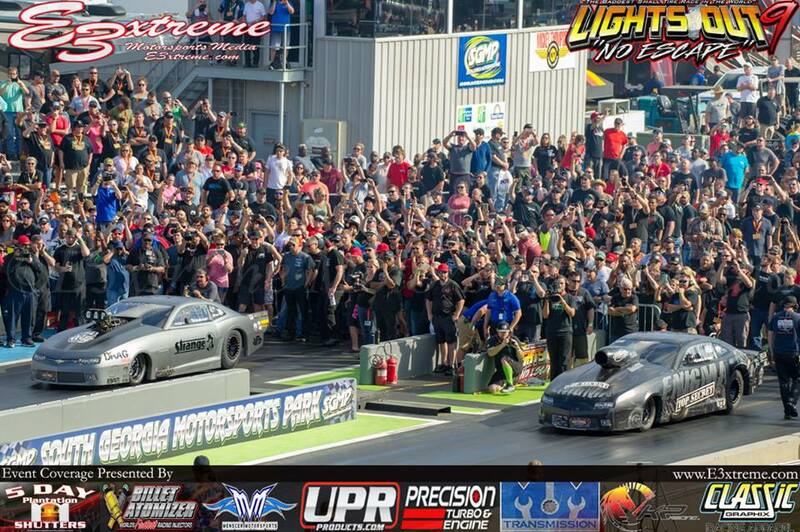 I am not getting away from the Mid-West Pro Mod Series in any way, shape or form. I'm not leaving the series; I haven't sold the series; so we can crush any rumors about me selling it. I have not,” stressed Haney, who also owns and promotes the all-eighth-mile drag racing organization with eight sanctioned events this year, plus a special, winner-take-all, $50,000 race Nov. 1-3, at the Texas Motorplex, near Dallas. 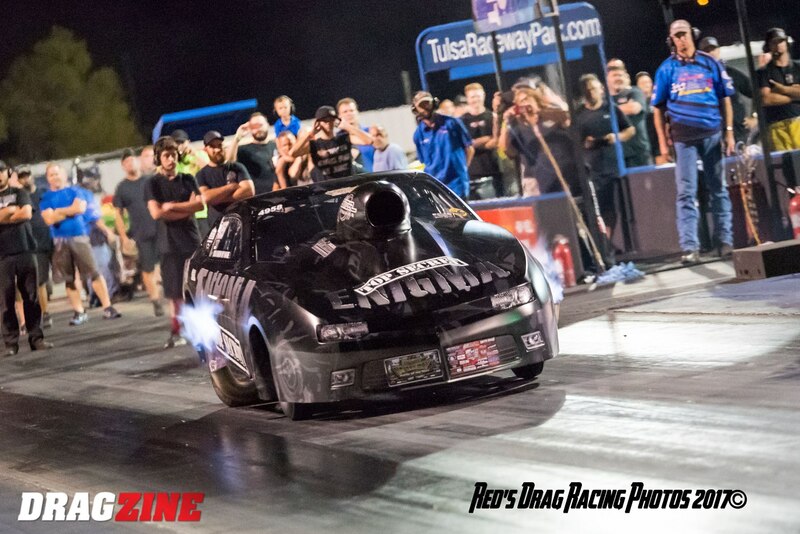 However, Haney said he feels ready to pursue new goals for Keith Haney Racing, his well-established drag racing team. “Right now, having two cars is making it a little difficult to just have enough people to run everything. So what I'm doing next, I'm not quite ready to say, but both cars are for sale. You can buy either one turnkey, or you can buy either one as a roller. Or you can buy ‘em both! Just reach out to me if you're interested,” Haney suggested to prospective buyers. Despite the impending sales, Haney confirmed he’ll still be racing “Notorious” in the MWPMS Pro Mod class next weekend (Aug. 2-4), at Gateway Motorsports Park, near St. Louis. As usual, crew chief Brandon Switzer will monitor event data via the Internet before calling in his engine tune-ups, while co-crew chief Brandon Pesz will handle all on-site chassis tweaks and trackside decisions. Regardless, Haney has a lot of racing left on his busy schedule this year. Following next weekend’s MWPMS event, he’ll again be racing with the MWPMS Sep. 7-8, at the new Xtreme Raceway Park in Ferris, TX. Two weeks later (Sep. 21-23), he will return to the Gateway facility near St. Louis to compete in just his second-career NHRA Pro Mod event, driving a Summit Racing Equipment-backed 2016 Camaro for car owner Rickie Smith. “I'm excited about being able to run the NHRA quarter mile again with Ricky and course my tuner, Brandon Switzer, and that's basically the start of four races in a row because the week after that we'll be running ‘Enigma’ again at No Mercy; the week after that I'll be running the NHRA series again in Dallas, and the week after that it's the Mid-West series finals in Tulsa,” Haney said. 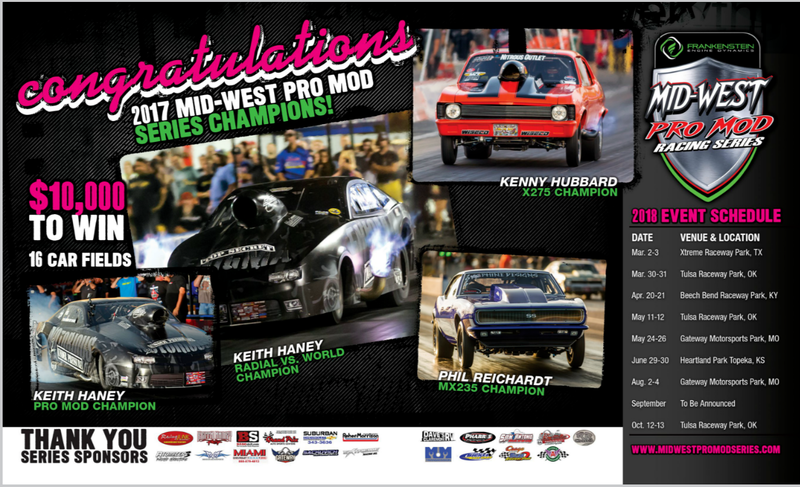 Based in Tulsa, Oklahoma, Keith Haney Racing (www.keithhaneyracing.com) fields two cars in the Mid-West Pro Mod Series (MWPMS), as well as for select NHRA and PDRA races and one-off special events. Keith Haney Racing appreciates the support of sponsors Summit Racing Equipment, Lucas Oil, Strange Engineering, RacingJunk.com, Reher-Morrison Racing Engines, MoTeC Systems USA, Switzer Dynamics, Brandon Pesz Performance & Tuning, M&M Transmission, Menscer Motorsports, Total Seal, Mickey Thompson, Kryptonite Kustomz, Browell Bellhousing, and Larry Jeffers Race Cars.